Category: Hikarimono (silver, shiny fish). Season: late winter into spring. When a sea bream is around one year of age and six inches in length, it is called kasugo (child of spring), and is considered hikarimono (silver / shiny fish). 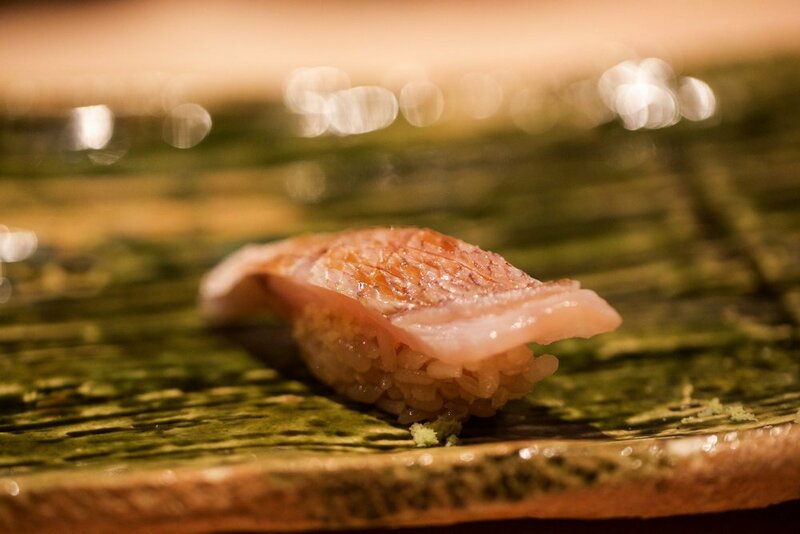 As the fish ages, its is called tai or madai and is then considered a white flesh fish, or shiromi. While madai flesh is rich and fatty, kasugo is quite lean. Edomae style preparation of kasugo is typical of hikarimono: the fish is first scaled and deboned, then salted for about half an hour. The salt is rinsed off with vinegar, then the fish is soaked in fresh vinegar for just a few minutes. It should not be marinated for too long, or the flesh will dry out. The skin should be left on, and ideally the fish should be paired with oboro and good akasu seasoned rice. The resulting flavors are amazingly complex: salty, sour, umami, sweet... it is all there in one perfect bite.